On Saturday the Auction at Graceland netted $330,531 in sales from the 160 pieces of Elvis Presley memorabilia up for auction. Highlights included a Gold and Diamond Lion Head Ring Elvis owned and gave to Charlie Hodge, one of the Memphis Mafia. It was estimated to sell for $10,000 - $15,000 and went for $37,500. Elvis’ Colt “Police Positive Special” .32 Caliber Pistol which he gave to bodyguard Richard Grob sold for $10,625.00 on an estimate of $4,000 - $6,000. 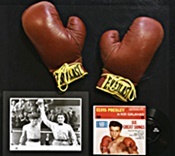 Elvis Kid Galahad Boxing Glove made $11,875, this was also above the top estimate of $10,000. There were also two other pieces that Elvis gave to Charlie Hodge, which included a sapphire and gold ring along with an “Indian Head” gold coin ring dated from 1911. Other items that were especially popular at the Graceland auction were images of Elvis. Some of these included Terry Wood photographs which showed Elvis Presley’s 1956 concert held in Tupelo, Mississippi, Presley’s hometown, which earned $8,125. There were also 35mm negatives that were originals of an Elvis Presley jam session which featured the guitarist Scotty Moore, who passed away last year. These were estimated to be worth $2,000, but sold for $6,250. (see two pics below). Trude Forsher also held an archive of photos that sold for $6,250, with the pre-auction estimate listed at $1,500. There are numerous other items at the Auction at Graceland that held interest for bidders, especially personal belongings of Elvis which had been used often. These included things like a platinum album award for Aloha from Hawaii, which sold for $9,375, a blue suede jacket that Elvis Presley wore which fetched $4,750, a diamond cluster cocktail ring that was auctioned at $13,750, a card which showed that Presley was certified as a sixth-degree black belt in karate received $2,375, and a Union 76 credit card from the 1970s which sold at $3,375.